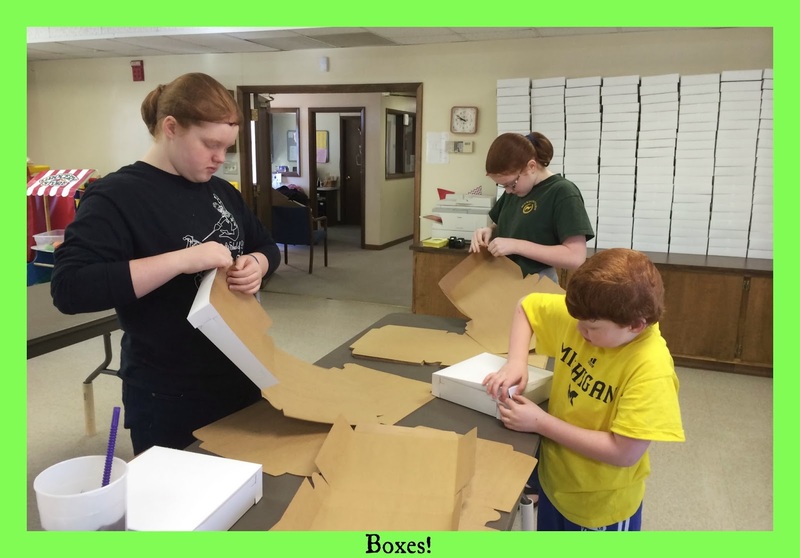 We've recently started attending a small Moravian church, and we love it. We attended a large, contemporary church for years and loved it, but I've realized that my children do better in a small church environment, and so do I. One fun thing our church does is make chicken pies. They make a lot of them, usually more than 200 every time. This past weekend, my children and I were able to help them. One of the best things about homeschooling is the ability to take a day or two and do some things we wouldn't be able to do if we had a traditional school schedule. Then, we set to work assembling the boxes for the pies once they were ready. Emma and I folded them, while Abbie helped put on stickers and keep count so we knew when we'd done enough. We also had people making dough, and cooking chicken outside in a tent. It was SEVEN DEGREES F that morning - that is COLD for North Carolina! Those men were champs, though, and just kept bundled up while they worked. Once the chicken was cooked, we had to shred it to get it ready to put into the pies. Also, someone was in the kitchen making gravy from the broth. When a batch of dough was finished, it was divided into sections and weighed so that each pie would be uniform. 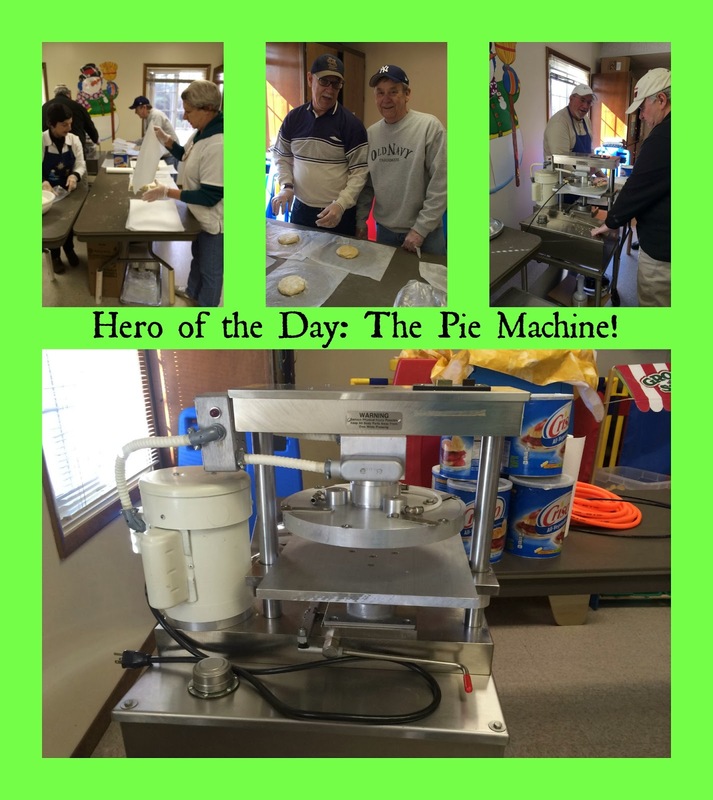 On Saturday, we finished up shredding the rest of the chicken, and got to work assembling pies. There were some crusts that had been made before hand and frozen, ready to be separated and put to use. They also have this amazing pie machine that flattens the dough into top-ready crusts, and will also put it into pie plates with nicely crimped edges. That is quite a piece of technology! It certainly made the work go more quickly. Some of the ladies told me that before they had the machine, they would have to stand and roll out dough for 200+ pies. I can barely manage to do crust for one pie competently. Wow. It was fun to participate in this activity that is so important to our church. 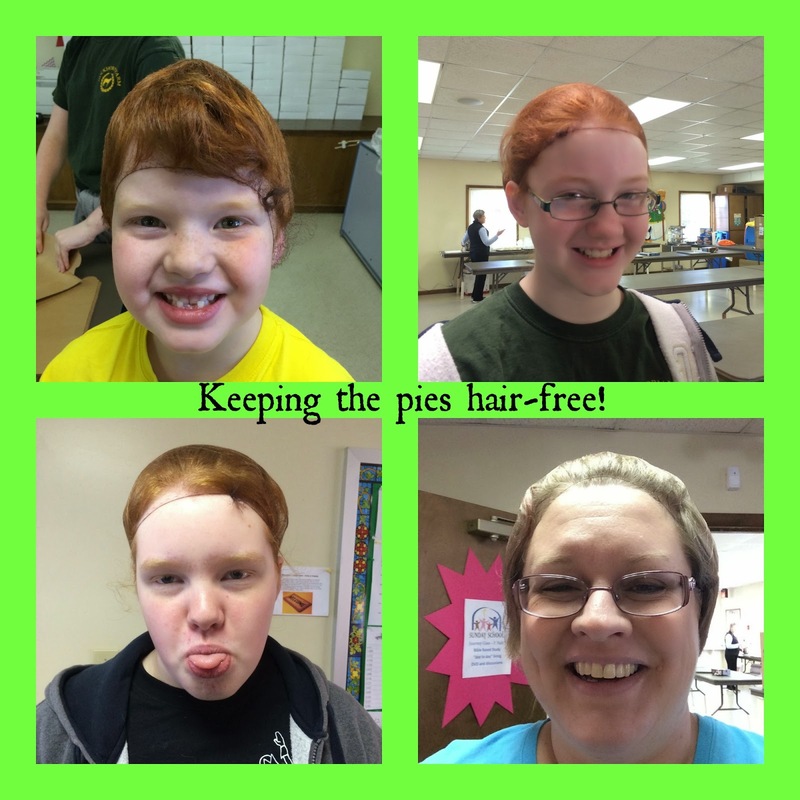 They measured chicken for each pie, added gravy, butter, and pepper, and then put the top crusts on. Emma, Isaac and I worked with our friend Thelma to cut out little shapes from dough to decorate the top of each pie, too. We even got to bring one home for dinner! Why do they make so many chicken pies? Are they sold as a fundraiser? Hi Honey! 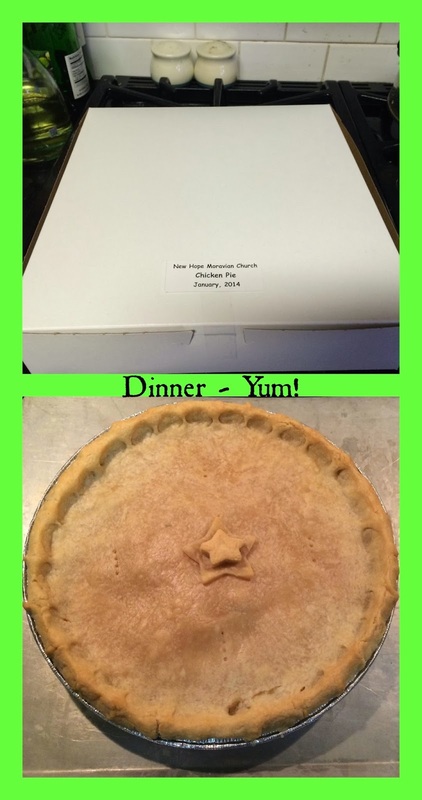 They do make the pies for a fundraiser, and also to spread the word about our church in the community. It's been a great thing for them! We get lots of people asking about the pies and the church every time we do it.